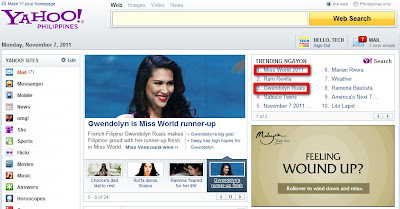 Gwendolyn Ruais is Miss World 2011 First Runner-Up! Trends on Yahoo! Pinoy Pride! Totally reinforcing the inarguable fact that Filipinos are some of the most beautiful people in the world, Miss Philippines Gwendolyn Ruais today bagged first runner-up title in Miss World 2011 pageant held in London. Receiving a rousing applause as soon as the name of her country was mentioned, Gwendolyn told the judges, "To be Miss World is my dream job. And I say job because it is a lot of responsibilities. But there is nothing I love more than communicating with other people. As Miss World, you get to use your potential and your voice to help people from all around the world, and what is more wonderful than doing what you love by helping others." Largely due to this impassioned and witty answer, some pageant critics and experts are saying that Gwendolyn should have been won the crown. Anyway. TP congratulates Miss Venezuela for being Miss World 2011. Mabuhay ka, Gwendolyn! You make all Filipinos the world over proud!